This crane is parked between the courthouse and justice center. 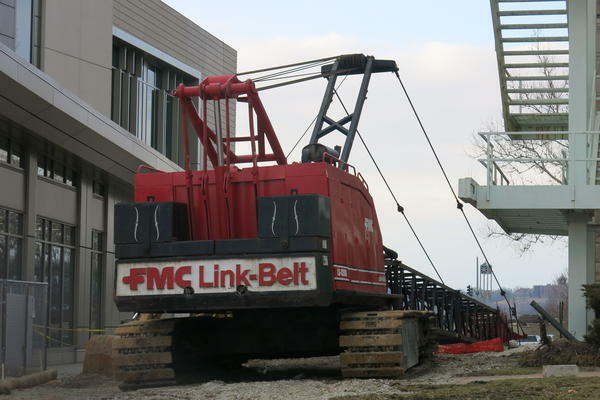 Valley Construction workers attached the boom on Wednesday. The boom has been attached to a crane as Valley Construction prepares to demolish the courthouse. The plaintiffs in the Rock Island County courthouse lawsuit are not giving up. The five historic preservation groups and two individuals are appealing a judge's dismissal of their case earlier this week. And their lawyer filed the appeal on Thursday in Rock Island. Tuesday's ruling from a Peoria County judge seemed to clear the way for demolition to begin this week or next. Even though a crane is parked between the courthouse and justice center, it appears Valley Construction has not yet started tearing it down. Another company completed asbestos removal earlier this year. The appeal requests a "stay of judgment" while the case is being heard, and may be heard by the Illinois Third District Appellate Court in Ottawa. (Previous story) A wrecking ball has not yet hit the Rock Island County Courthouse. Yesterday, a Peoria County judge dismissed a lawsuit filed by historic preservation groups to prevent demolition. She also canceled a temporary restraining order. Today, the Public Building Commission has not given the "go ahead" to tear down the courthouse. Commission Chair, Brent Ganahl, says he needs to talk to the group's attorney before meeting with the rest of the commission to decide the next step. The general contractor, Gilbane, is managing the demolition project. Landmarks Illinois and the other plaintiffs may file an appeal.